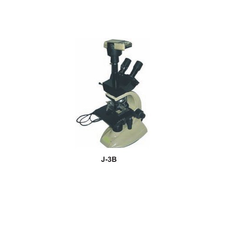 High quality Trinocular Microscope for School, Colleges and Research Institutes. Stand: Single mold Sturdy stand with anti rust materials. Extended base with hand rests for enhancedstability and comfort. Body: Light Weight, latest design with improved system for strain free working. Eyepiece Tube: Inclined at 30 degrees. Observation Head: Rota table through 360 degrees. All prisms and optical surfaces are with antireflection coating. Inter pupillary adjustment provided. 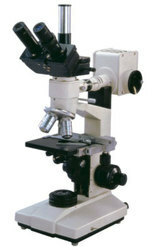 Trinocular Research Microscope :- Having following optical combination. Objective : 4x 10x, 40x SL and 100x SL oil immersion. Eye Pieces : H6 x and WF 10x (paired) & P 7x for photomicrography. a) All Optics are best Indian. b) All optics are best Indian but imported 100x oil immersion. Trinocularresearch microscope designed to meet the needs of research, medical and educational institutions. Ball bearing guide ways in slide ensure highly sensitive focusing system and co-axial focusing system provides highest degree on working convenience.